In March, former home secretary Madhukar Gupta held a closed door meeting with former Union home secretaries to hear their opinions on the functioning of the ministry of home affairs. Though retired, Gupta was asked by the ruling government to head a committee to revamp the home ministry’s organisational structure and processes. This was to prepare the ministry to meet security challenges of the 21st century. Four retired secretaries of the MHA, including L.C. Goyal and G.K. Pillai, were part of the discussion. The former top bureaucrats raised concerns over the diminishing role of the MHA, particularly in security-related matters. The Union home ministry is the overarching ministry on all internal security-related issues, and plays a pivotal role in Centre-state relations and national security. But, it was felt that the effectiveness of the MHA has dwindled in terms of sharing the burden on tasks. The committee found that the ministry has not been able to keep pace with the challenges it is dealing with, not just in terms of its capacity, but skills and resources that are neither adequately augmented or exploited. In the northeast, the decades-old Naga insurgency problem has also not reached the solution that was promised by the Naga Accord announced by Prime Minister Narendra Modi in 2015. Other mechanisms to strengthen internal security like the rolling out of the National Intelligence Grid and online registration of FIRs through the Crime and Criminal Tracking Network and Systems project are still struggling to take off. Former top bureaucrats who spoke to THE WEEK pointed out that the annual chief ministers’ conference on internal security, formerly organised by the MHA every year, used to act as a key platform for healthy discussion and criticism between the Centre and states. They feel that the absence of this forum since 2013 has created a sense of withdrawal among states. The annual gathering, which had the representation of all political parties, not only reinforced the idea of a federal polity, but became the touchstone of some very important decisions. It was at this forum, in 2013, that former home minister P. Chidambaram’s proposal to create a National Counter Terrorism Centre (NCTC) was shot down after chief ministers Narendra Modi, Mamata Banerjee, Naveen Patnaik and Raman Singh rejected it, saying it violated the federal structure of the Constitution. Political alignments aside, the forum was also used by chief ministers to exchange ideas, draw common goals and hand over wish lists to the Centre. The discussions with the Centre ranged from the need to withdraw the Armed Forces Special Powers Act in J&K, and accusations of neglect by the opposition-ruled states, to chief ministers of hinterland states offering offbeat solutions on coastal security and vice versa. 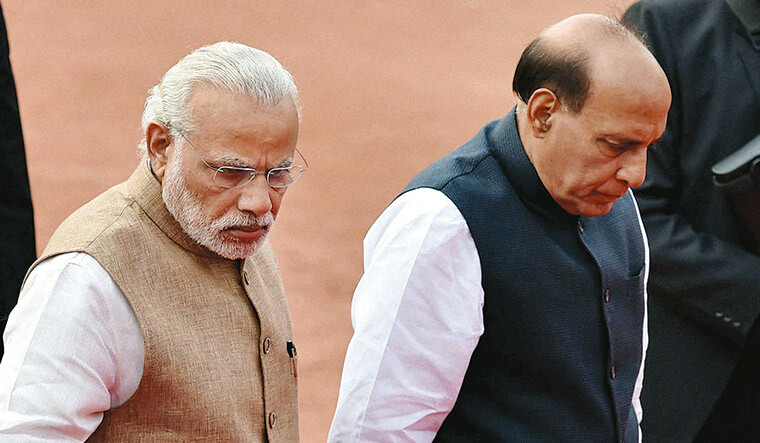 The home ministry, however, feels it has expanded its role more meaningfully in the last four years, even though chief ministers of all 29 states and seven Union territories have not all sat together to discuss internal security with it. The bigger question, however, that may need to be addressed alongside will be how to make the MHA more effective. Should the government diminish the role of the mammoth ministry or diminish the ministry itself to give it a mammoth role is something that may need some more thought in these changing times.